Bun The Grid start 2019 off with an intensely loud bang coming in the form of label co- founder Bulu’s first full outing on his own label. After producing music for 8 years, releasing a full EP on London label Fine Dining as well as his self-released Bulu Sound compilations, 2019 looks set to be a big year for Bulu with multiple releases lined up as well as a full LP in the pipeline. BTG005 starts out with Fiyah, a minimal yet beastly track packed with relentless sub elements and dominant percussion. Fiyah is quickly followed by Bulu’s first collaboration with label co-founder Etch entitled Colide which is both unique and acute. A slow building intro of Bulu’s ominous synth work quickly gets swallowed up by Etch’s signature off grid percussion until Colide explodes into a barrage of both Bulu & Etch’s influences in equal measures, relentlessly attacking both your ears and chest. Dark dominant zaps and razor sharp percussion are set to lay siege to any dance floor. Bulu finishes off the A-Side with Change Places a 176BPM throw back to wobbly dubstep with a more modern half time feel. 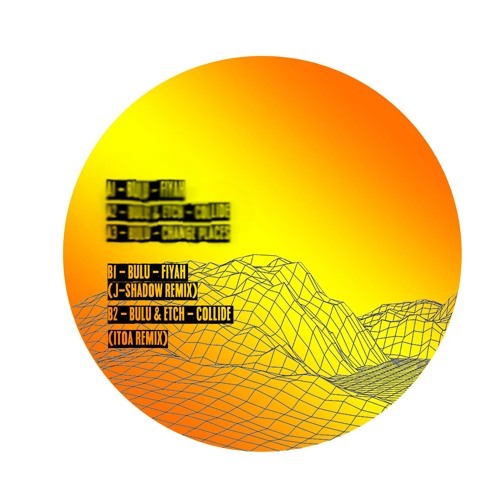 In usual BTG style the B-Side contains solely remixes, this time taken on by newcomer J-Shadow, who is rumoured to have a massive release lined up on BTG in the near future. He takes Fiyah down to a different tempo bracket and plasters his unique sound all over the original elements making the track deeper, and slower building but just as vivid. Finally, one of the early BTG family, and now mainstay at Exit Records, Itoa takes Colide and rips it apart into an entirely new realm which can only be described as Itoa’s unique blend of Bassline, Juke and Jungle, you truly have to listen to this one to understand. The originals will be release physically and digitally whilst the remixes will be vinyl only.